Posted byBob Jones	 January 13, 2013 January 25, 2013 Leave a comment on Should one-way streets be two-way for cyclists? 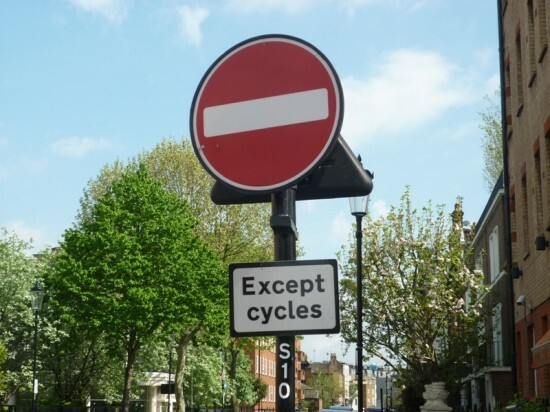 Having spotted this recent piece on road.cc about a Brighton cyclist fined for cycling against the traffic in a one way street, my memory was triggered about a Department for Transport trial scheme in London to permit cyclists to do exactly that. I dug around a little. The first story I found was a 2009 one in the Daily Mail announcing the trial scheme, and pointing out that the Prime Minister, David Cameron, had recently been caught cycling the wrong way along a one-way street. The goal of the trial was to encourage more cycling by enabling cyclists to use the most direct routes to their destinations. The Daily Mail has a poll on the online story, the results of which can be interpreted as disappointing, with 84% of respondents stating the cyclists should not be allowed to cycle against the traffic. Of course, at least 84% of respondents are likely to be motorists who don’t cycle, so I think we can safely dismiss that bit of nonsense as not being relevant to the issue. I couldn’t navigate my way through the DfT website to get an update on the trial but this blog story from BikeMinded last September warmed my heart because it’s clear that London is opening more and more of its streets to cyclists. More London one-way streets are allowing cyclists to ride against the flow of traffic. When done responsibly, perhaps this is safer than having cars and trucks come up behind you? Two things struck me about PC Welsh’s comments. First, her claim that cycling the wrong way along St James’s Street can end in serious injury for both pedestrians and cyclists is a statement of the blindingly obvious. Cycling anywhere there are pedestrians can do that. It doesn’t necessarily follow that cycling against the traffic along a one-way street is more dangerous than cycling along any other city street. Second, she felt that the cyclist should have accepted more responsibility for “almost hitting a pedestrian.” On that basis, shouldn’t we be able to prosecute all of the motorist that almost hit cyclists, or all the pedestrians who, on my commute into Bath, almost topple me from my bike by walking into the road without looking? If almost causing an accident is an offence, I’m sure Brighton’s streets could keep PC Welsh very busy indeed. She could probably notch up enough prosecutions to get promoted…so this could be just the thin end of the wedge.